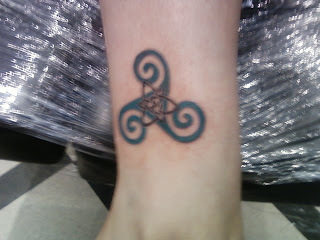 Astrid Cloverleaf: a knitting persona blog: new ink! I went to dinner with a friend and her hubby tonight. Our plan was to get food, then go get our tattoo designs priced to come back on Saturday to get inked. 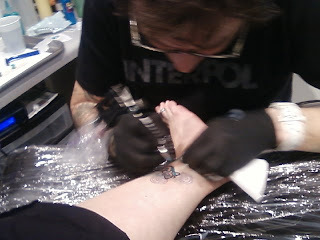 Well, the plan changed about 5 minutes after pricing them... we decided to stay and get inked! Yup, below are some pictures in the progression of my newest inking. It's my 5th and I just love it.